Tiller School in North Carolina is an award-winning, tuition-free public charter school focusing on the social and academic excellence of its student body. For over 20 years, Tiller School has experienced a steady growth in enrollment and reached maximum capacity during this school session. Specifically, the school has seen a growth in its Exceptional Children (EC) Classroom. EC is designed to give help to children with disabilities and help them reach their full potential. “This program now requires two full-time teachers. We are space-limited and have to share a classroom originally intended for use by one teacher. In addition, our students are extremely sensitive to distractions,” comments staff member Mike Easton. 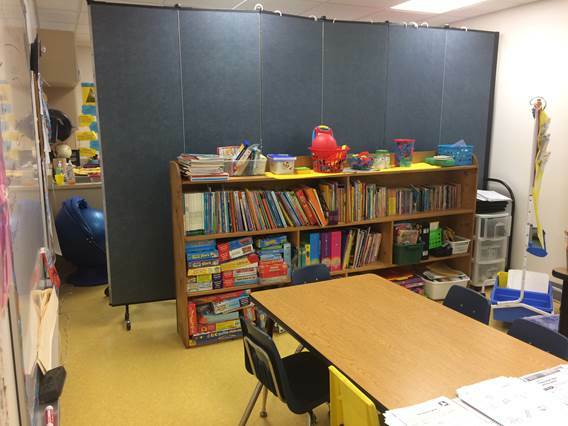 After researching several temporary classroom dividers, Tiller School reached out to Screenflex looking or a solution to divide a classroom into two fully functioning classrooms, and a way to cut both visual and audible distractions. “We are using our room divider to create two equitable, semi-private workspaces for my partner Exceptional Children teacher and I. We can close it when we both have small group instruction, or partly open it when we have a joint planning period. We fold the temporary classroom dividers all the way when we have holiday parties for students or special events. On my side, where there is limited wall space, I use the divider to display students’ pictures and work samples. It is useful and attractive and we love it! !” adds Easton. Additionally, because the sturdy divider is constructed from a honeycomb core and two layers of environmentally friendly fiberglass insulation, ambient noise is absorbed, lessening distracting noises. While the school’s main reason to purchase the temporary walls is to create an extra classroom in the EC program, they quickly found additional uses for the portable wall. Easton explains, “When the need arose to provide privacy for a staff benefit, our Executive Director borrowed our divider for the day. It folded up easily and was simple to roll to the location where it was needed. It provided a perfect solution to a temporary problem, as well as a wonderful solution to our long-term solution in EC.” The school Director loves knowing that she can easily use it anywhere on campus. With its use of Screenflex portable partitions, Tiller School is best able to serve its growing student body with the quality space and resources they deserve. Free Lunch for All: Really?